This article is about the car. For other uses, see Trabant (disambiguation). The Trabant (/ˈtræbænt, -ənt/; German: [tʁaˈbant]) is an automobile which was produced from 1957 to 1990 by former East German car manufacturer VEB Sachsenring Automobilwerke Zwickau. It is often seen as symbolic of the former East Germany and the collapse of the Eastern Bloc in general. According to automotive journalist Doug DeMuro, the Trabant was loud, slow, poorly designed, and badly built. The Trabant had a duroplast body mounted on a one-piece steel chassis (a so-called unibody), front-wheel drive, a transverse engine, and independent suspension – unusual features at that time (1950s) — but it remained the same up until the 1990s. The 1980s model had no tachometer, no headlights or turn signals indicator, no fuel gauge, no rear seat belts, no external fuel door, and drivers had to pour a mix of gasoline and oil directly under the bonnet/hood. Called "a spark plug with a roof", 3,096,999 Trabants in a number of models were produced over nearly three decades with few significant changes in their basic design. Older models have been sought by collectors in the United States due to their low cost and fewer restrictions on the importation of antique cars. The Trabant also gained a following among car tuning and rally racing enthusiasts. The German word trabant, derived from the Middle High German drabant (“Hussite foot soldier”), means "satellite" or "companion". [a] The car's name was inspired by the Soviet Sputnik satellite. The cars are often referred to as "Trabbi" or "Trabi". Produced without major changes for nearly 30 years, the Trabant became the most common automobile in East Germany. It came to symbolize the country during the fall of the Berlin Wall in 1989, as images of East Germans crossing the border into West Germany were broadcast around the globe. Being a state monopoly, it took ten years to acquire a Trabant, East German buyers were placed on a waiting-list of up to thirteen years. The waiting time depended on their proximity to Berlin, the capital. Official state price was 7,450 GDR marks and the demand to production ratio was forty three to one (1989). The free market price for a second-hand one was more than twice the price of a new one, and the average worker had to wait ten to thirteen years on a waiting list, or, if available, pay more than double for a second hand one. The Trabant had a steel unibody frame, with the roof, trunk lid, hood, fenders and doors made of duroplast, a hard plastic made from recycled cotton waste from the Soviet Union and phenol resins from the East German dye industry. It was the second car with a body made of recycled material; the first was the AWZ P70 Zwickau, produced from 1955 to 1959. The material was durable, and the average lifespan of a Trabant was 28 years. Trabant quality was poor, reliability was terrible, closer inspection revealed "patchy assembly quality", with atrocious maintenance record. The engine for the 500, 600 and the original 601 was a small two-stroke engine with two cylinders, accounting for the vehicle's modest performance. Its curb weight was about 600 kg (1,323 lb). When it ceased production in 1989, the Trabant delivered 19 kilowatts (25 hp) from a 600 cc (37 cu in) displacement. It took 21 seconds to accelerate from zero to its top speed of 100 km/h (62 mph). The engine produced a very smoky exhaust and was a significant source of air pollution: nine times the hydrocarbons and five times the carbon-monoxide emissions of the average 2007 European car. Its fuel consumption was 7 l/100 km (40 mpg‑imp; 34 mpg‑US). Since the engine did not have an oil pump, two-stroke oil had to be added to the 24-liter (6.3 U.S. gal; 5.3 imp gal) fuel tank at a 50:1 (or 33:1) ratio of fuel to oil at each fill-up. Contemporary gas stations in countries where two-stroke engines were common sold a premixed gas-oil mixture at the pump. Because the Trabant had no fuel pump, its fuel tank was above the motor so fuel could reach the carburetor by gravity; this increased the risk of fire in front-end accidents. Earlier models had no fuel gauge, and a dipstick was inserted into the tank to determine how much fuel remained. Best known for its dull color scheme and cramped, uncomfortable ride, the Trabant is an object of ridicule for many Germans and is regarded as symbolic of the fall of the Eastern Bloc. Known as a "spark plug with a roof" because of its small size, the car did gain public affection. Its design remained essentially unchanged from its introduction in the late 1950s, and the last model was introduced in 1964. In contrast, the West German Volkswagen Beetle received a number of updates (including improvements in efficiency) over a similar period. The first of the Trabants left the VEB Sachsenring Automobilwerke Zwickau factory in Saxony on 7 November 1957. It was a relatively advanced car when it was formally introduced the following year, with front wheel drive, unitary construction and independent suspension. The Trabant's greatest shortcoming was its engine. By the late 1950s, many small West European cars (such as the Renault) had cleaner, more-efficient four-stroke engines, but budgetary constraints and raw-materials shortages mandated an outdated (but inexpensive) two-stroke engine in the Trabant. It was technically equivalent to the West German Lloyd automobile, a similarly sized car with an air-cooled, two-cylinder four-stroke engine. The Trabant had a front, transversely mounted engine and front-wheel drive in an era when many European cars were using rear-mounted engines or front-mounted engines with rear-wheel drive. Its greatest drawback was its largely unchanged production; the car's two-stroke engine made it obsolete by the 1970s, limiting exports to Western Europe. The Trabant's air-cooled, 500 cc (31 cu in) engine—upgraded to 600 cc (37 cu in) in 1962–63—was derived from a pre-war DKW design with minor alterations during its production run. The first Saab car had a larger (764 cc), water-cooled, two-cylinder two-stroke engine. Wartburg, an East German manufacturer of larger sedans, also used a water-cooled, three-cylinder, 1,000 cc (61 cu in), two-stroke DKW engine. The original Trabant, introduced in 1958, was the P50. Trabant's base model, it shared a large number of interchangeable parts with the latest 1.1s. The 500 cc, 18 hp (13 kW) P50 evolved into a 20 hp (15 kW) version with a fully synchronized gearbox in 1960, and received a 23 hp (17 kW), 500 cc (31 cu in) engine in 1962 as the P60. The Trabant's designers expected production to extend until 1967 at the latest, and East German designers and engineers created a series of more-sophisticated prototypes intended to replace the P601; several are displayed at the Dresden Transport Museum. Each proposal for a new model was rejected by the East German government due to shortages of the raw materials required in larger quantities for the more-advanced designs. 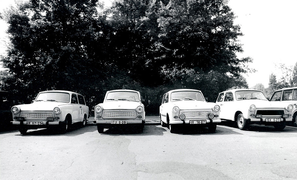 As a result, the Trabant remained largely unchanged for more than a quarter-century. Also unchanged was its production method, which was extremely labour-intensive. Production started from 34,000 in 1964, reached 100,000 in 1973, to a high of 150,000 in 1989. The Trabant 1100 (also known as the P1100) was a 601 with a better-performing 1.05-liter (64 cu in), 45 hp (34 kW) VW Polo engine. With a more-modern look (including a floor-mounted gearshift), it was quieter and cleaner than its predecessor. The 1100 had front disc brakes, and its wheel assembly was borrowed from Volkswagen. It was produced from 1989 to 1991, in parallel with the two-stroke P601. Except for the engine and transmission, many parts from older P50s, P60s and 601s were compatible with the 1100. In mid-1989, thousands of East Germans began loading their Trabants with as much as they could carry and drove to Hungary or Czechoslovakia en route to West Germany on the "Trabi Trail". Many had to get special permission to drive their Trabants into West Germany, since the cars did not meet West German emissions standards and polluted the air at four times the European average. A licensed version of the Volkswagen Polo engine replaced the Trabant's two-stroke engine in 1989, the result of a trade agreement between East and West Germany. The model, the Trabant 1.1, also had minor improvements to its brake and signal lights, a renovated grille, and MacPherson struts instead of a leaf-spring-suspended chassis. When the 1.1 began production in May 1990, the two German states had already agreed to reunification. The Trabant ceased production in 1991, and the Zwickau factory in Mosel (where the Trabant 1.1 was manufactured) was sold to Volkswagen AG; the rest of the company became HQM Sachsenring GmbH. Volkswagen redeveloped the Zwickau factory, which is a centre for engine production and produces some Volkswagen Golfs and Passats. According to Richard Leiby, the Trabant had become "a symbol of the technological and social backwardness of the East German state." Trabants became well known in the West after the fall of the Berlin Wall, when many were abandoned by their Eastern owners who migrated west. Unlike the Lada Niva, Škoda Estelle, Polski Fiat and Yugo, the Trabant had negligible sales in Western Europe. A Trabant could be bought for as little as a few Deutsche Marks during the early 1990s, and many were given away. Although prices recovered as they became collectors' items, they remain inexpensive cars. In her Bodywork project, performance artist Liz Cohen transformed a 1987 Trabant into a 1973 Chevrolet El Camino. The Trabant was planned to return to production in Uzbekistan as the Olimp during the late 1990s, but only one model was produced. Former Bulgarian Foreign Minister and Atlantic Club of Bulgaria founding president Solomon Passy owned a Trabant which was blessed by Pope John Paul II in 2002 and which he took NATO Secretaries General Manfred Wörner, George Robertson, and Jaap de Hoop Scheffer for rides. In 2005, Passy donated the vehicle (which had become symbolic of Bulgaria's NATO accession) to the National Historical Museum of Bulgaria. In 1997 the Trabant was celebrated for passing the moose test without rolling over, as the Mercedes-Benz W168 had; a Thuringian newspaper's headline read, "Come and get us, moose! Trabi passes A-Class killer test". The Trabant entered the world of diplomacy in 2007 when Steven Fisher, deputy head of mission at the British Embassy in Budapest, used a 1.1 (painted as close to British racing green as possible) as his diplomatic car. American Trabant owners celebrate the fall of the Berlin Wall with the Parade of Trabants, an annual early-November rally held in Washington, D.C. The event, sponsored by the privately owned International Spy Museum, includes street tours in Trabants, rides, live German music and displays about East Germany. The Herpa company, a Bavarian miniature-vehicle manufacturer, bought the rights to the Trabant name and showed a scale model of a "newTrabi" at the 2007 Frankfurt Motor Show. Plans for production included a limited run, possibly with a BMW engine. A Trabant nT model was unveiled two years later in Frankfurt. The Trabant nT consortium includes Herpa, the German specialized-auto-parts manufacturer IndiKar and the German automobile-engineering company IAV. The group was looking for investment, design and production in the Trabant's original hometown of Zwickau, with sales "in 2012". The Trabant nT electric car would be equipped with a 45 kW (60 hp; 61 PS) asynchronous motor powered by a lithium-ion battery. ^ According to Elof Hellquist's Svensk etymologisk ordbok (Swedish Etymological Dictionary, ISBN 91-40-01978-0), the word also exists in Low German dravant, French trabant and Italian trabante but its origin is unknown: "It is not even certain whether the Romance words have been borrowed from the German, or vice versa." ^ a b Legends of the Open Road. Rizzoli International Publications. ISBN 978-88-6130-066-8. ^ World Cars 1978. Herald Books. ISBN 0-910714-10-X. ^ a b "The Trabant Was an Awful Car Made by Communists". November 2016. Retrieved 17 November 2018. ^ "Trabant Canada". Trabant.ca. Archived from the original on 28 May 2010. Retrieved 2 December 2010. ^ a b c d James, Kyle (19 May 2007). "Go, Trabi, Go! East Germany's Darling Car Turns 50". Deutsche Welle. Archived from the original on 11 September 2007. ^ Stokes, Raymond G. (2000). "Plastics and the New Society: The German Democratic Republic in the 1950s and 1960s". In Reid, Susan E.; Crowley, David. Style and Socialism: Modernity and Material Culture in Post-War Eastern Europe. Oxford, U.K.; New York, N.Y.: Berg. ISBN 1-85973-239-9. OCLC 898724665. ^ a b c Williams, Adam (6 September 2007). "The 'Trabi' automobile, once a symbol of East Germany, to be revived". International Herald Tribune. Reuters. Archived from the original on 4 December 2008. Retrieved 17 September 2011. ^ a b c "German Firm Plans to Launch Revamped Trabant". Deutsche Welle. 7 September 2007. Archived from the original on 24 February 2009. Retrieved 2 December 2010. ^ a b "The 12 worst cars ever built". January 2010. ^ a b c d "The Trabant: Consumption, Eigen-Sinn, and Movement". History Workshop Journal. 18 September 2009. ^ a b "Special From Germany: Show 402". Scientific American Frontiers. PBS. Archived from the original on 3 July 2015. ^ Cotta, Rick. "Driving a Trabant". ^ "BBC". bbc.co.uk. 1 January 2007. Archived from the original on 16 January 2014. Retrieved 14 January 2014. ^ "carfolio.com". carfolio.com. 28 February 2013. Archived from the original on 16 January 2014. Retrieved 2 May 2014. ^ "Trans National Trabant Tour 2007". Transtrabant.cz. Archived from the original on 18 July 2011. Retrieved 2 December 2010. ^ Silk, Bernard (3 May 2003). "Daily Telegraph". London: Telegraph.co.uk. Archived from the original on 23 October 2011. Retrieved 2 December 2010. ^ Hockenos, Paul (7 November 2014). "Berlin Welcomes Back the Trabant, if Only for a Day". The New York Times. Archived from the original on 7 November 2017. ^ Richard Stroup (2003). Eco-nomics: What Everyone Should Know about Economics and the Environment. p. 32. ISBN 978-1-930865-44-0. ^ "Translate Trabant from German to English". www.interglot.com. Archived from the original on 7 October 2017. Retrieved 9 May 2018. ^ Sebetsyen, Victor (2009). Revolution 1989: The Fall of the Soviet Empire. New York City: Pantheon Books. ISBN 0-375-42532-2. ^ "Trabant". Archived from the original on 14 April 2011. ^ Richard A. Leiby (1999). The Unification of Germany, 1989–1990. Greenwood. p. 185. ISBN 978-0-313-29969-8. ^ Keats, Jonathon (July 2003). "High-Performance Artist". Wired. Archived from the original on 1 December 2016. Retrieved 1 December 2016. ^ "Trabant Clunks Back to Life". Moscowtimes.ru. Archived from the original on 11 February 2008. Retrieved 2 December 2010. ^ "Automobile Industry In Uzbekistan". Archived from the original on 3 July 2011. Retrieved 2 December 2010. ^ "Соломон Паси подари трабанта си на НИМ" (in Bulgarian). Вести. 13 July 2005. Archived from the original on 18 July 2011. Retrieved 13 November 2009. ^ "Petite feat". drive.com.au. 6 May 2005. Archived from the original on 25 March 2012. Retrieved 2 December 2010. ^ "British Deputy Ambassador's ride small and green". Politics.Hu. Archived from the original on 21 July 2011. Retrieved 28 April 2009. ^ Zsolt, Csikós (10 November 2008). "A brit nagykövethelyettes Trabantja ("The British Deputy Ambassador's Trabant")". TotalCar.hu Ltd. Archived from the original on 12 August 2011. Retrieved 5 October 2012. ^ "Sixth Annual Parade of Trabants". International Spy Museum. Archived from the original on 28 December 2017. Retrieved 5 October 2012. ^ Williams, Adam (6 September 2007). "The 'Trabi' automobile, once a symbol of East Germany, to be revived". The New York Times. Archived from the original on 13 January 2015. Retrieved 5 October 2012. ^ "Photo Gallery: Electric Trabant Unveiled at Frankfurt Motor Show". Spiegel Online. 16 September 2009. Archived from the original on 29 March 2014. Retrieved 5 October 2012. ^ "German group develops new Trabant". London: news.bbc.co.uk. 14 August 2009. Retrieved 14 August 2009. ^ Hall, Allan (14 August 2009). "Smoke-belching Trabant to be reborn as electric car". London: telegraph.co.uk. Archived from the original on 17 August 2009. Retrieved 14 August 2009. ^ "The "newTrabi" idea becomes the "Trabant nT" concept car". Trabant nT GmbH. Archived from the original on 5 September 2012. Retrieved 5 October 2012. ^ "Eco Cars: All-electric Trabant NT Gears To Clean 20-year-old Mess". Ecofriend. 17 September 2009. Archived from the original on 23 September 2009. Retrieved 14 October 2009. Wikimedia Commons has media related to Trabant vehicles. Technical Data and additional Information about Trabant 601.